WATCH: Is this modified Jeep the ultimate off-roader? Cape Town - Discussions regarding the difference between four-wheel drive and all-wheel drive often results in a disagreement with one group claiming that the other doesn’t know what the heck they are talking about. The two terms also appear to be interchangeable with some websites and publications making the same claim as this article tough with the attributes of the two terms swapped around. Other engineers like Ferdinand Porche dabbled in all-wheel drive a few years earlier but it was Spyker’s car that featured the first transfer case and separate drive shafts that we are familiar with today. Spyker of course also founded Spyker Cars who recently build the very impressive Spyker C8 Preliator. But let’s get back to the differences. • 4x4 – Four by four, a general term for off-roading. Spyker’s car had permanent 4WD, meaning that both front and rear axles were powered by the transmission all of the time. Other examples of permanent four-wheel drives vehicle are Land Rovers and Land Cruisers. Each wheel receives 25% of the available engine power. The driver has the option of 4H (four high, the default setting) and 4L (four low, low range gearing). The 4WD system in these vehicles cannot be switched to regular two wheel drive unless one of the drive-shafts are physically removed. Another innovation came from the Four Wheel Drive Auto Co. in 1911 who improved their transfer case to allow selectable 4WD, meaning that the transfer case allowed part-time four-wheel drive plus high and low gear ratios. 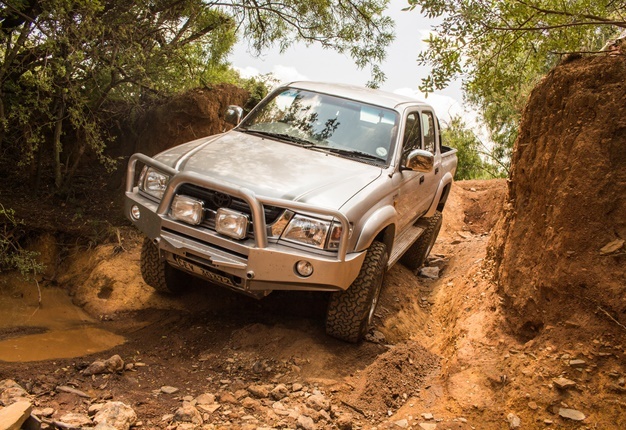 These four-wheel drive vehicles are typically found in bakkies. Two-wheel drive is the default mode and should always be selected when travelling on tarred roads or hard, unyielding surfaces. 4WD mode needs to be physically engaged by the driver and if done so on a tarred road a phenomenon called axle wind-up invariably crops up. Axle wind-up occur because most part-time 4WD vehicles don’t have a central differential and the torque difference between the front and rear axles places strain on the transmission and/or axles. One of two nasty things happen during axles wind-up; Either the wheels slip or the transmission breaks...the former is bad enough but the latter can be downright catastrophic. Mitsubishi’s Pajero has been around for a good few years but their super-select is arguably one of the better four-wheel drive systems out there. The Pajero has part-time 4WD but owners often leave the transmission in 4H, only switching to 2H when they want to save fuel on long, dead-straight highways. Additionally, 4Hlc (four wheel drive in high range gearing with gear train differentials locked) can be selected when travelling across technical terrain such as desert sand above 30km/h. Another transmission option is 4Llc (four wheel drive in low range with differentials locked) but the Pajero needs to be stationary before selecting this mode and speeds should ideally be kept below 30km/h. This is where the fists usually start flying. Technically the term all-wheel drive may be applied to a vehicle that is driven in all its wheels including six-wheel and eight-wheel drive vehicles. Generally the term is applied by manufacturers to road-going vehicles. The reason why a Subaru isn’t considered an equal to a Pajero in the tough stuff is not really about of ground clearance. In fact, a Pajero (225 mm) is only about 1cm higher off the ground than an Outback (213 mm). The Subaru Outback does have X-mode which is a sophisticated traction control system that mimics a limited slip differential, but nothing beats a lockable diff when off-roading. All-wheel drive often makes use of technology such as viscous couplings, torque converters and other dark arts to automatically switch between one axle doing all the work or both axles sharing the load. Some cars have a rear axle bias while others favour the front axle. The driver has very little control over where the power goes, if any. Supercars such as the Audi R8, Lamborghini Huracan and Nissan GTR Nismo has permanent four wheel drive but no low range gearing nor a transfer case nor lockable differentials. So in a nutshell: 4WD is suited for slippery off-roading while AWD provides extra grip on road surfaces. And what about 4X4? That’s just a sticker on the back of your 4WD.